James Cronin released by Ireland for tomorrow’s Pro12 clash. Darren Sweetnam starts on the right wing. DARREN SWEETNAM WILL make his first competitive start when Munster travel to Zebre in the Pro12 tomorrow. With the bulk of his star names away on international duty, Anthony Foley has been forced to make eight changes. One Ireland international who has been made available is James Cronin who starts at loosehead. Niall Scannell, Mark Chisholm, Jack O’Donoghue and Robin Copeland are the other changes in the forwards, while Tomás O’Leary comes in at scrum-half and the fit-again Andrew Conway starts at full-back. Dave O’Callaghan is named among the replacements as he continues his comeback from an adductor injury. Kick-off in the Stadio Sergio Lanfranchi is at 2pm Irish time. 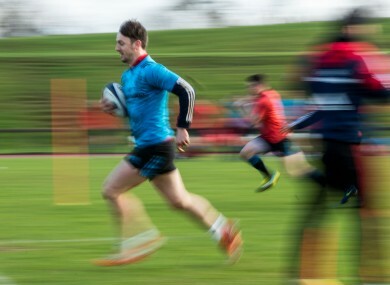 Email “Sweetnam set for his first start as Munster change 8 for Zebre trip”. Feedback on “Sweetnam set for his first start as Munster change 8 for Zebre trip”.